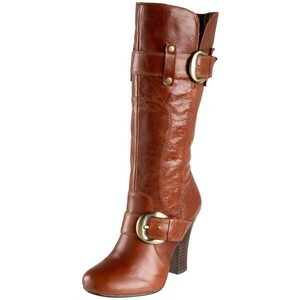 I bought the Naughty Monkey Haute Rock Boots because I saw it on sale from $199.00 to $74.99. I bought it in the color Chocolate. I first noticed it on Selena Gomez’s character on her show Wizards of Waverly place. I am always searching for the right pair of boots so I went online, researched and found out it was on sale. When I received it, I was pretty excited. It was beautiful. The leather was crinkly because it was going for the broken into look. I didn’t mind it. I thought it added a good texture to it. It is a 3 1/2 inch heel with two gold buckles on the side. The shaft measured about 14″ and had a opening of 15″ around. I fit it very well with a 7 1/2, and it molded to my calves. I loved how it looked on me and how much taller I became. The downside of the shoe: It hurt like HELL. There was very poor arch support and no sole padding at all. I returned the shoes. After 10 minutes walking around the house, I was already in pain. I do not wear heels very well. I tend to feel pain very quickly. Also if I walk in heels for more than 7 days, my ankles becomes tight and pain shoots up and down my leg. I don’t know why this happens. I’m sure this doesn’t happen to Selena Gomez since she teeters on heels all the time. But check these shoes out for a totally rocker like look. Selena Gomez as Alex Russo on Wizards of Waverly Place. Thanks to selenastyle.com for the image.